The Clifton Vale House, designed by Freight Architects, couldn’t be more distinguishable from its semi-detached neighbour. Its neat, boxy shape, orderly screens and concise gestures stand in stark contrast to its conjoined twin whose pithed, grey terracotta-tiled roof, classical columns and ornamental window grilles present a confusing architectural potpourri. The client, who lives here with his wife and two children, requested a ‘tropical minimalist’ house – a reflection of their love for good ventilation and natural light and aversion to clutter. They wanted it to feel spacious and akin to living outdoors where air-conditioning isn’t always essential. 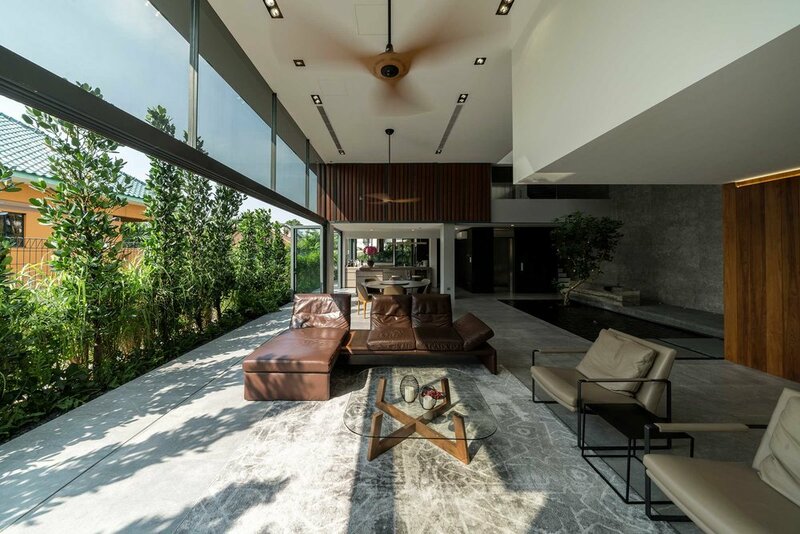 ‘We began by exploring ways of bringing in more airflow and natural light into a standard semi-detached typology where one side is always attached to a parti-wall,’ shares Kee Jing Zhi, one of the firm’s three design directors and co-founders. He looked to the traditional shophouse for inspiration, but here the results are a modern appropriation rather than a direct import of elements. ‘The front of the house faces east and the long side faces south, which is the prevailing wind direction for the Southwest monsoon season. We designed the main opening of the house facing the south prevailing wind and created a courtyard in the centre of the house for cross-ventilation,’ he explains. 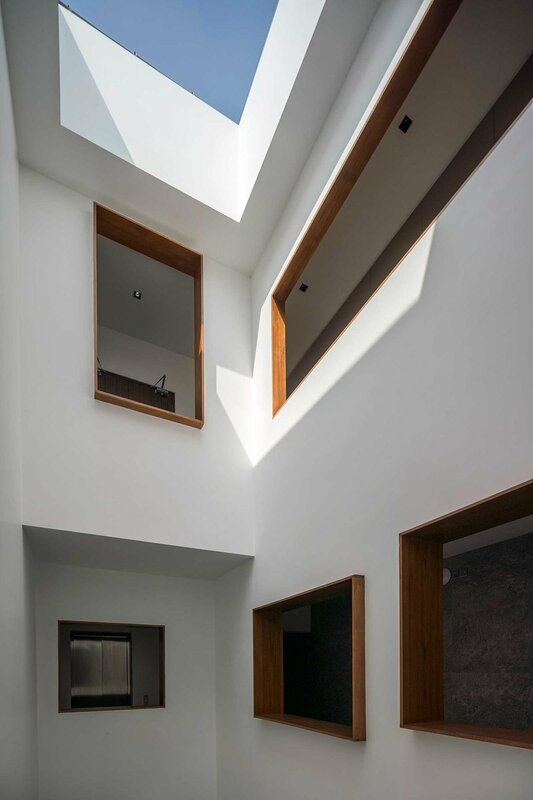 The courtyard, which tunnels up into the attic, is capped with a skylight that allows the interiors to be well-lit and naturally ventilated. It closes automatically during rain and provides a view of the sky overhead. Located just beyond the front door in the centre of the house, the courtyard is anchored by a meditative body of water. It’s flanked by the living room, which, buffered by a garden on the other side, represents the kind of protected outdoor space the client so desired. The air well above the pond also becomes a central ‘breathing shaft’ for the bedrooms, which are arranged around the courtyard with apertures opening onto it. Brevity of material – mainly stone and Chengai timber – and abundant greenery aids in creating a feeling of restfulness and tropicality. Equally disciplined is the house’s formal composition, which came about from the thoughtful placement of ‘boxes’ to create interesting spatial experiences. One example of this is found in the entry sequence, where a black box movie room directly above the entrance creates a sense of compression, accentuating the loftiness of the courtyard that follows. This house is tropical and minimal, but in no way is it staid.